How to replace the fuel filter on 2000 dodge caravan? The 2000 Dodge Caravan was produced with a 3.3 liter, six-cylinder, fuel-injected engine. The fuel system utilizes a fuel filter located near the fuel tank to eliminate debris from reaching the engine and damaging the internal components. Replacing the fuel filter every 30,000 to 40,000 miles will keep the fuel system in your Dodge Caravan in optimal condition. A clean fuel filter will help maintain the vehicle's fuel injectors and the fuel pressure regulator. Remove the fuel pump relay from the power distribution center to relieve the fuel system pressure. Start the engine and allow it to run until it stalls. Try to start it again and let it run until it stalls. Repeat this procedure until it will no longer start. Turn the ignition off. Disconnect the negative battery cable and raise the vehicle. Support the fuel tank with a transmission jack. Locate the fuel filter on the top of your Dodge Caravan fuel tank. Take the fuel line out from the front of the tank and then remove the ground strap. Next, remove the inboard side of the fuel tank straps and front T-strap fastener. Lower the tank about 6 inches. Detach the fuel lines from the fuel pump module and then remove the fuel filter. Put the new filter in place. Tighten the fuel filter bolts to 40 inch pounds. Reconnect the fuel lines to the fuel pump module and reposition the tank. Replace the front T-strap fastener and tighten it to 250 inch pounds. Put the inboard fuel tank straps back and tighten them to 40 foot pounds. Put on the ground strap and connect the fuel line in the front of the tank. Start the engine of your Dodge Caravan and check for leaks. Always let the pressure out of the fuel system before you disconnect the fuel lines. Do this carefully so fuel is not sprayed on your skin, face or eyes. Labels: How to replace the fuel filter on 2000 dodge caravan. service the ride control on 1992 Cadillac Seville? In 92 model year Cadillac had major problems with the air ride suspension. The dealership has to install a special wiring harness to overide the computer. But once they do this there is no longer an air ride. If your air ride suspension still works it may be better to ignore the light. Without air it is a stiff ride kinda like an older corvette. I had the wiring harness and new struts installed at the dealer . There was a recall so you might find the harness at salvage yard. There is a way to have the SSS module blink out the problem codes but the info it reports may not be reliable. To make a long story short the most economical way to solve this problem is to by-pass the whole system. I found a webpage that explains how to do it. You need a couple inexpensive parts the can be found on http://www.gmpartsdirect.com for less money than the dealer. Seville with Computer Command Ride (CCR): Refer to the Service Manual page 8D-12. Set the BCM override value BS09 to 0 by using the warmer and cooler buttons. Store this value by pressing the Econ button on the climate control panel and the Instant Econ button on the Fuel Data/Drivers Information Center for about five seconds. The new value will be stored even through the indicator does not flash. Remove the key from the ignition. Disconnect both battery cables from the battery. When both cables have been disconnected, touch the ends of the cables together and hold for five seconds. This will discharge the capacitors in the system and allow the system to perform properly when the battery cables are reconnected. Advise the customer they will have to reset all radio stations and clock. Some owners may bring their vehicles in for service with an illuminated service suspension light. The service suspension indicator lamp is telling the owner that the vehicle is due for strut/shock replacement, a maintenance item. The customer may elect to have passive struts installed in their vehicles due to the repair cost savings and/or parts availability. The installation of passive shock/struts will result in handling characteristics which are the equal to a like vehicle without the computer controlled ride, with all other components such as tires, tire pressure, springs, etc. being equal. The installation of (4) new passive struts will cause the continued illumination of the service suspension indicator. If desired by the customer, the service indicator may be disabled AFTER THE INSTALLATION OF THE (4) NEW PASSIVE STRUTS, using the appropriate service procedure listed below. This bulletin DOES NOT authorize this procedure unless (4) NEW PASSIVE STRUTS WERE INSTALLED ON THE VEHICLE. • 1989-1992 Allante with Speed Dependent Damping (SDD): Refer to the Service Manual page 8D-13 (1989) or 8D-14 (1990-1992). On these vehicles, adjust the BCM Override value "BS08". To do this, use the warmer/cooler button on the CCDIC to decrease the BCM override value "BS08" which is displayed when you enter the system by two(2). When the desired number is displayed on the CCDIC, it must be stored by holding the "Elapsed Time" and "Fuel Used" buttons until the new value flashes on and off. When it flashes on and off, the new value has been stored. • 1991 Eldorado and Seville with Computer Command Ride (CCR): Refer to the Service Manual page 8D-12. Set the BCM override value BS09 to 0 by using the warmer and cooler buttons. Store this value by pressing the Econ button on the climate control panel and the Instant Econ button on the Fuel Data/Drivers Information Center for about five seconds. The new value will be stored even through the indicator does not flash. Remove the key from the ignition. Disconnect both battery cables from the battery. When both cables have been disconnected, touch the ends of the cables together and hold for five seconds. This will discharge the capacitors in the system and allow the system to perform properly when the battery cables are reconnected. Advise the customer they will have to reset all radio stations and clock. • 1992/1993 Eldorado and Seville with Speed Sensitive Suspension and 4.9L Engine Only: Refer to page 8A-43-6 in the 1992 Eldorado Seville Service Manual. o Run a wire from a switched ignition (hot in run) source to relay pin 85. • 1991-1993 DeVille with Computer Command Ride (CCR): Refer to the Service Manual, page 8A-43-0. Cut Circuit 1300 (Dark Green wire) at the CCR module (Pin C15) to disable the indicator lamp. Tape the wires back into the harness to prevent shorting to other components. It says only to do this when switching to non electric struts but if you feel your original struts are OK it still works and you can keep your original ones. had the struts stay in firm mode in my opinion. My advise would be keeping your old struts and bypassing the system with the disable information link above. In the short term you can press the information buttton on the dash to make the service ride control message go away until you start up the car again. Service manuals are available from time to time on Ebay. You don't need it for this if you follow directions carefully. You can buy the relay (P/N 12193601) and the connector(P/N15306045) at www.gmpartsdirect.com . The module you are looking for is mounted on the rear seat support, lower right, right of module marked Bosch, lower right side, accessible from the trunk. It is about 5" X 4" with a connector on the bottom. Following the instructions previously posted, you will identify which pins on the relay correspond to the wires on the connector/socket. The relay is plainly marked as to pin identity. The socket has extra connections for other uses so just strip the ends of the wires you will be using. You will find the pink wire coming out of the connector on the module. Cut it at a convenient place. You will wire pin 86 to the section of pink wire going to the module. You will wire pin 87A to the other section of pink wire. You will locate the solid brown wire and splice the wire from pin 85 into it. You will run the wire from pin 30 to a good ground. I used on of the bolts holding the Bosch module to the seat support. When I did mine I soldered the connections and used shrink tubing and it has held fine for about 8 or 10 years. There was a bulletin issued in August of 2000 about this. I quote from the bulletin:Some owners may bring their vehicles in for service with an illuminated service suspension light. The service suspension indicator lamp is telling the owner that the vehicle is due for strut/shock replacement, a maintenance item. The customer may elect to have passive struts installed in their vehicles due to repair cost savings and/or parts availability. The installation of passive shock/struts will result in handling characteristics which are the equal to a like vehicle without the computer controlled ride, with all other components such as tires, tire pressure, springs, etc. being equal. The installation of (4) new passive struts will cause the continued illumination of the service suspension indicator. If desired by the customer, the service indicator may be disabled AFTER THE INSTALLATION OF THE (4) NEW PASSIVE STRUTS, using the appropriate service procedure listed below. This bulletin DOES NOT authorize this procedure unless (4) NEW PASSIVE STRUTS WERE INSTALLED ON THE VEHICLE.At this point you can just ignore the light or find a Cadillac, Pontiac, Buick or Oldsmobile dealer to disable the light. It might be one of the GROUND WIRES for the motor I had the same problem with my 92 sts when the gas pedal is pressed the motor moves slightly and a loose wire will stall the motor and also confuse the computer giving wrong messages my loose wire was on the drivers side of the motor coming out of a bundle near the transmision I found it by accident while looking there and reving the motor and seen a spark then motor stalled. Labels: service the ride control on 1992 Cadillac Seville. Follow upper radiator hose to engine to locate thermostat housing. With the engine cold, drain the cooling system. 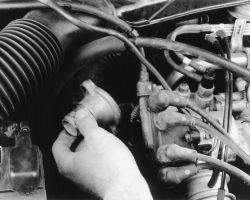 Disconnect the radiator hose from the thermostat housing outlet. Remove the thermostat housing outlet and remove the thermostat. Using a putty knife, clean the gasket mounting surfaces. If the thermostat is equipped with a pin valve, be sure to install the thermostat with the pin facing upward. Install a new thermostat the gasket, O-ring or sealant (as applicable). Always install the spring end of the thermostat facing the engine. Tighten the thermostat cover-to-thermostat housing bolts to 9 ft. lbs. (12 Nm). Fill, then bleed the cooling system. Check for leaks. Labels: where is thermostat located on 1991 Honda Accord.